So, holiday time is really here now, and the chances are you aren’t actually reading this at all, because you’re turning a shade of lurid red on a beach on the Costa del Sol, letting your full English breakfast go down, and waiting to go for nueve cervezas before bellowing ‘Eggo y Chippo por favoro‘ at a humiliated waiter. 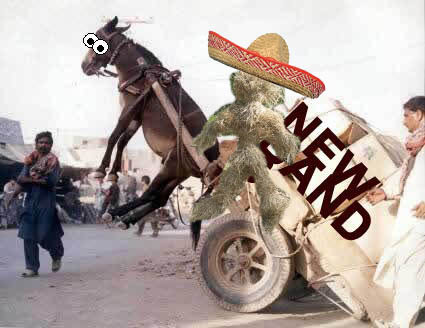 Thought: if we bring back straw donkeys from Spain as souvenirs, does the ANBAD Donkey bring back a straw human? Answer: YES [see above]. One Minute To Midnight Dream [So sad] snaps with tasty purpose, a tight and chiming pop-paean that, like a determinedly gloomy teenager, is nowhere near as sad as they think. Actually, this song is as chipper as any you’ll hear all week, and has the uncanny knack of sounding dub-slow and speed-punk quick all at once, and yet sounding like neither. Clever. SECOND! Bad Apes take their cues from jangly shoegaze pop like Ride’s first couple of albums and none of My Bloody Valentines’. They’ve got the phaze-y guitar sound and, for a very young band, have the knack for a zingy song nailed – all they need now are the stupid fringes and the loose jumpers that look as if they smell of tramps, and the transformation will be complete. THIRD! Choker – and while we’re talking about holidays, here’s a break from the usual bands featured on ANBAD: the first all-female rock band for ages that sounds like they’d be happier kicking you in the face rather than go shopping for retro-chic sunglasses and making cupcakes. I get the feeling Choker may have listened to a lot of Hole. This is a good thing. FINALLY! Bermuda Bonnie was a lo-fi ‘n’ cute hit on ANBAD a while ago – and now here is a handily summer-hols themed video, filmed in Coney Island, which seems like a fun place to go and spend a day spending money on shonky fairground rides and dropping ice creams into the sand. So like Blackpool, but pleasant. Posted on August 4, 2010 by Joe Sparrow. This entry was posted in Headline, Today's New Band and tagged Midweek Mixtape. Bookmark the permalink.